I’m a little envious of families that have rich food traditions linked to their culture. It seems my Italian, Polish, German, Mexican, and Indians friends grew up with fantastic foods with exotic names – insalata, pirogi, wurst, carnitas, and curries. Those are natural to them as roast beef and a side of broccoli are to me. Not that Mom was a bad cook, not by any stretch. Anyone who can get dinner on the table for twelve on a nightly basis is doing something right. But let’s face it, the culinary comfort zone of middle America in the and 1970’s and early 1980’s wasn’t very exciting. Oh, we would watch Yan Can Cook and The Frugal Gourmet on PBS, but our dinners were sturdy if not exciting. Home from college on summer break, I’d make pizza occasionally, so when I decided to make a calzone it wasn’t a big stretch, but it was new. I remember pulling it out of the oven, golden brown and steam piping out of the vent I’d cut in the top. I’d filled it with zucchini, cheese, sausage and a little tomato sauce. Cutting it open and watching the cheese ooze out, I was triumphant! Fast forward 30 years. Mom is gone, and the general population is much more knowledgable about a wide variety of foods. Ingredients that were rare then are common place today, and chefs have been elevated from behind-the-scene blue collar workers to rock stars celebrities. Yet that humble calzone (exotic though it was to us at the time) remains part of perhaps the oldest food tradition known to man. 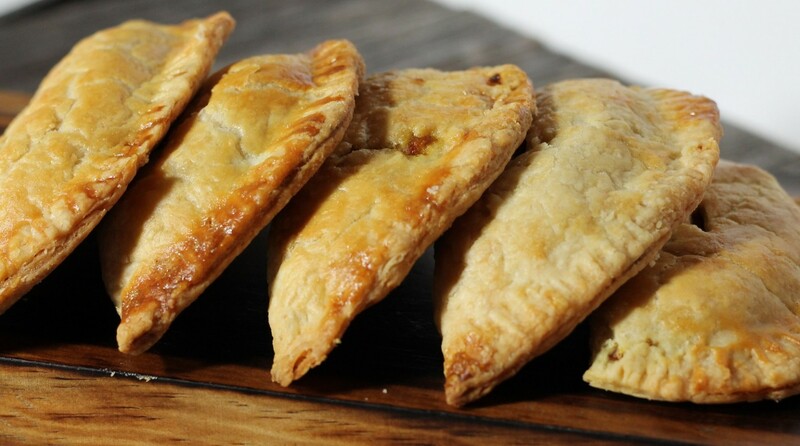 Hand pie, turnover, tart, empanada, sambouosek, pasty, calzone, samosa, call it what you will. I call it delicious! Baked or fried, these stuffed morsels are the original hand food, far predating that other hand held staple – the sandwich. Making these is a lot like many of the dishes I prepare, a bit time consuming, but not difficult and very rewarding! Before assembly filling should be at least cooled to room temperature. Fillings should be moist but not wet. Far better to slightly under fill than overfill the pastry. After assembly, hand pies should be chilled for at 20 minutes. If you’re not into making your own pastry dough – use puff pastry dough or even premade pie crust dough – just be sure to follow directions on the package regarding thawing. Make a bunch because you can freeze them and cook them up to 3 months later for a quick dinner. 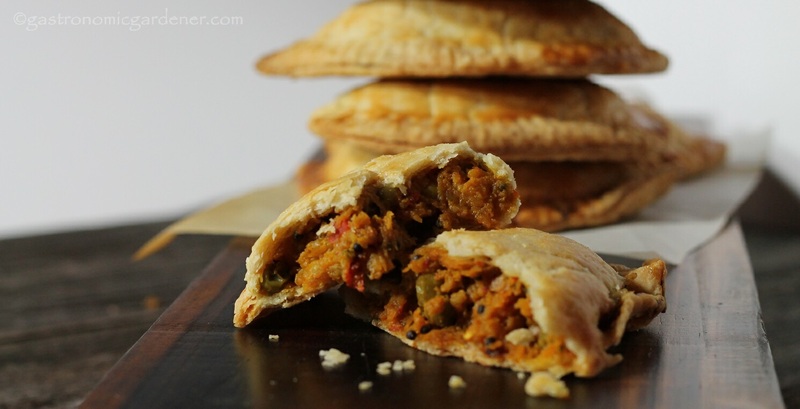 Almost anything can go inside a hand pie – left overs, meat, fruit. Use your imagination! For this post I’m making using short dough (if you use all vegetable shortening this is vegan) and a butternut from 2012’s garden. For a quick shortcut put onion garlic and ginger in food processor and whiz until finely chopped but not liquified. Reduce heat to low and simmer uncovered until squash is soft and liquid is almost gone. Add more broth or water if needed. 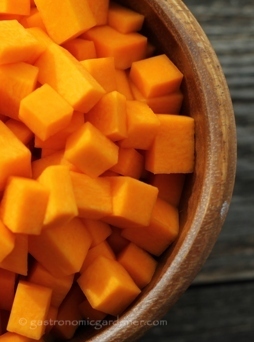 Once cool, the curried squash may be refrigerated for up to 3 days before making pies. It will be easier to work with 2 -3 dough balls at a time. Leave them in fridge until ready to use. Let pies cool for 10 minutes before devouring. These were awesome. Flakey crust, tender filling perfumed by the curry powder, followed by a sly burn that winks at you but doesn’t take your breath away. I’m pretty sure Mom would’ve like these, and who knows, maybe I’m starting my own family food tradition. wow those look amazing! and what a great way to use up your garden’s harvest! i think i still have some butternuts around here somewhere…. terrific job! I like them but I need to really practice my pastry making. I want to make them again but use a yeast dough. It was cool to use part of 2012’s harvest. They look lovely! The “all stacked-up” photo is very clever too. Of course the filling is different, but they remind me of the Jamaican Patties I made a few weeks ago. You’re Jamaican patties were so perfect looking, these are a bit more rustic I think. That’s the beauty of pies, fillings are almost infinite. They weren’t too hot John, just a whisper and a promise. I need to make calzones some time soon! what a lovely idea! they look tasty. i wish butternut squash grew better here in ireland. its wet enough but not really hot enough. Thanks Taylor, welcome back. How was Thailand? Stuff’em with anything, curried potatoes and cauliflower would be good too I think. Hi Tracey, Thanks so much for stopping in. They’d be perfect in a lunch box! Who knew calzones are a gateway food? I look forward to your take on it Smidge! I grew up in Texas where there were delicious spicy meat hand pies but nothing as good as this must be. Oh! I’d love to hear about that!